This protein shakes keeps it real and doesn’t use any protein powder, getting all of it’s protein power from actual food. 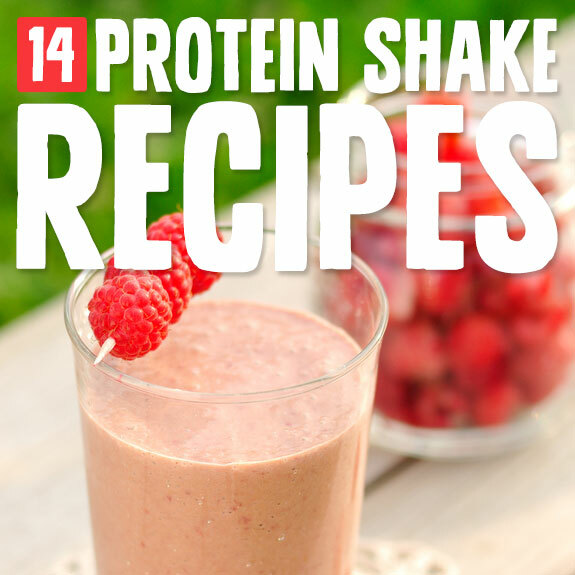 The result is that you get 18 grams of protein without using protein powder. 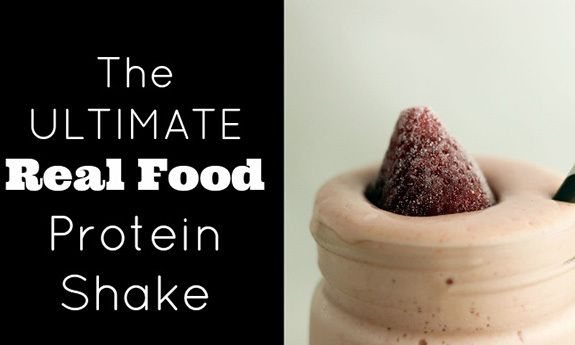 While you may get 25 or 30 grams or more of protein in a shake with protein powder, this is a good alternative if you don’t want to use protein powder while on the Paleo diet. 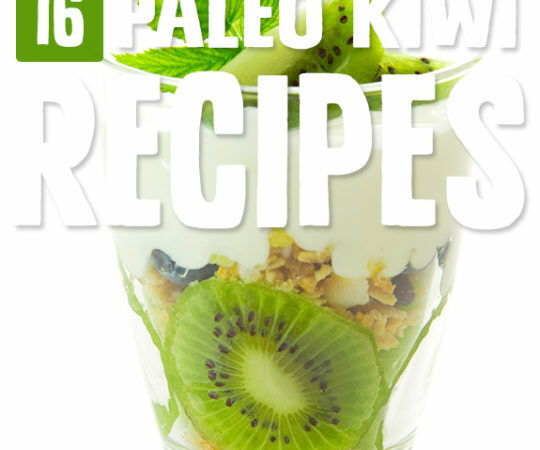 You’ll get less protein per serving, but you also be more in touch with the Paleo philosophy and avoid any gray areas. 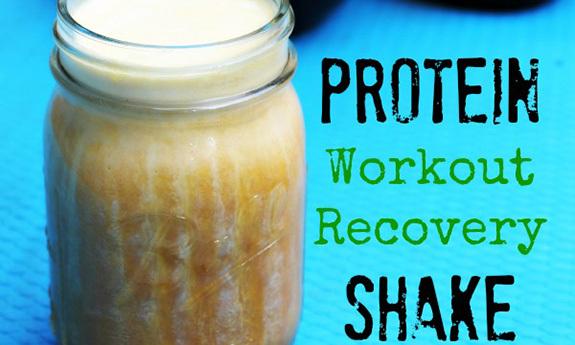 This shakes makes a strong case for using gelatin instead of protein powder to help you recover from a workout. Working out goes hand in hand with the Paleo philosophy, as our ancestors would have been getting a daily workout as part of their lifestyle. Recovering from an intense workout is crucial because it will help your muscles develop more quickly, and get you back into the gym giving it your all in a shorter time. What’s great about this shake is that each ingredients helps you, there are no fillers or anything unnecessary. 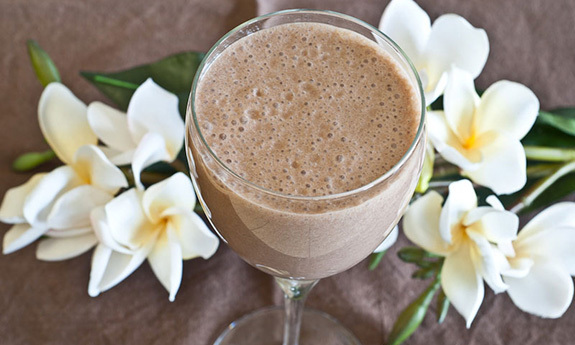 Here’s a protein shake especially suited to your morning workouts. 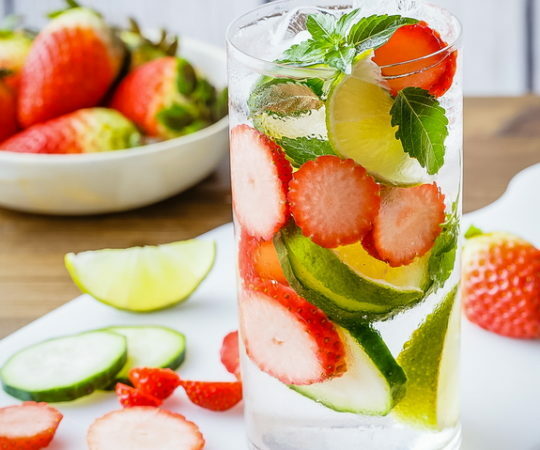 You can drink it before your workout so you have more protein to feed your muscles as you work out, or after your workout as a recovery shake. It’s made from cashew milk and uses egg white protein powder keeping it dairy free. This makes it a great option for those that don’t want to use whey protein powder and avoid any and all lactose issues. 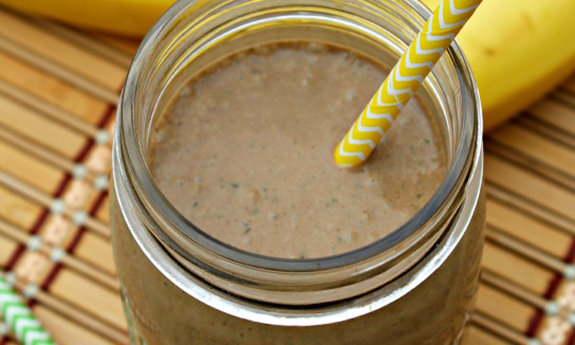 The banana gets lost in the coffee flavor, and the caffeine can help boost your metabolism. 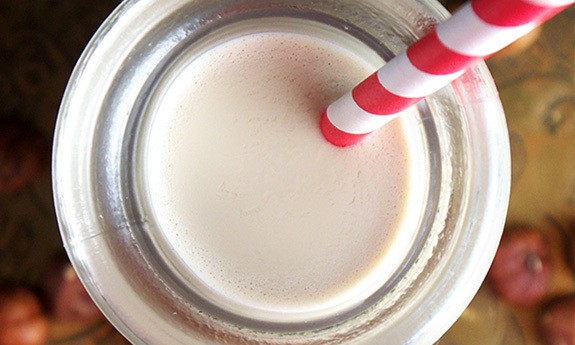 This is a nutty milkshake that will help your muscles feel better after a strenuous workout. It uses raw almond butter so you’ll definitely taste the almonds, and it also has almond milk instead of cow’s milk, adding a bit more to the almond flavor. This is one shake that uses whey protein powder to give you the protein your body is craving after a workout. This can easily be swapped out if you don’t want to use whey protein powder, but whey protein is one of the easiest protein powders to absorb and gets great results. The flavors of Chunky Monkey ice cream are used in this breakfast shake so that you can get a delicious yet nutritious start to your day. Of course there’s a banana in there, as this is one of the main components of the ice cream. But unlike the ice cream you won’t find any dairy in this shake, as they’ve gone with coconut milk instead. You’ll still be getting a rich, creamy flavor from it thanks to the coconut milk, and it also provides some protein. But the big protein punch comes from the use of gelatin, with some assistance from nut butter. 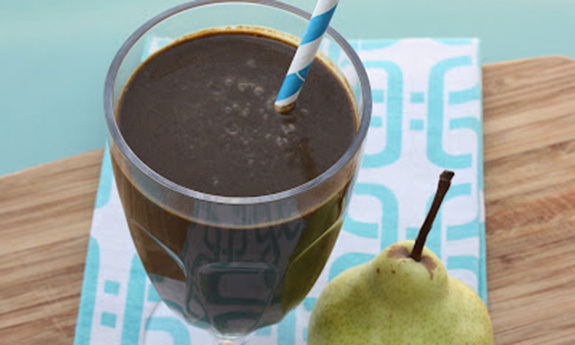 You don’t often see pears and chocolate combined, but it absolutely works in this protein shake. 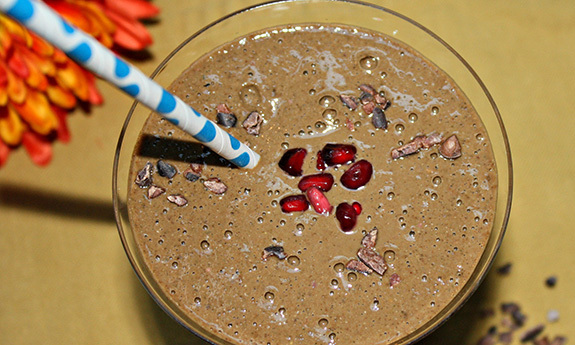 The pear provides something you don’t often get in a protein shake: fiber. There’s a cup of spinach that they’ve managed to sneak into the shake as well, as this also provides some protein, but not as much as the vegan hemp protein powder that they’re using. 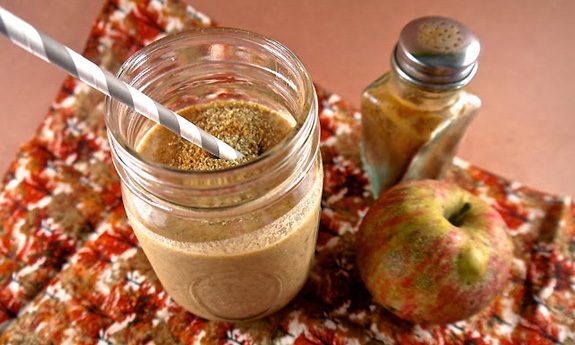 Overall this is a very nutritious shake, and one that you can use even if you’re not strength training as it will get you through to your next full meal. Almond butter makes a great substitute for peanut butter, since peanut butter is a no-go on Paleo. Here they’re using almond butter as the main source of protein, although you’ll get a bit more from the almond milk. 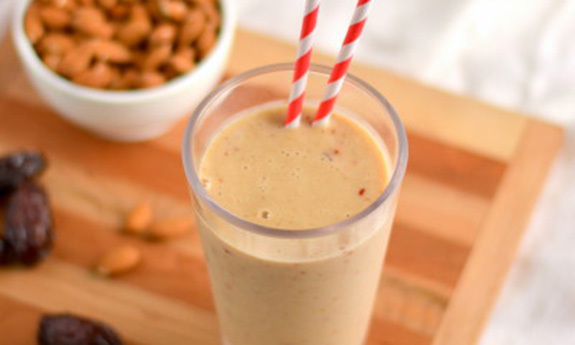 They’ve gone with creamy almond butter instead of crunchy, and this will help the blender make a nice smooth shake for you to enjoy. You simply can’t beat the combination of chocolate, banana, and almonds when it comes to a delicious protein treat. The cocoa powder is all you need to give it a real chocolate taste. 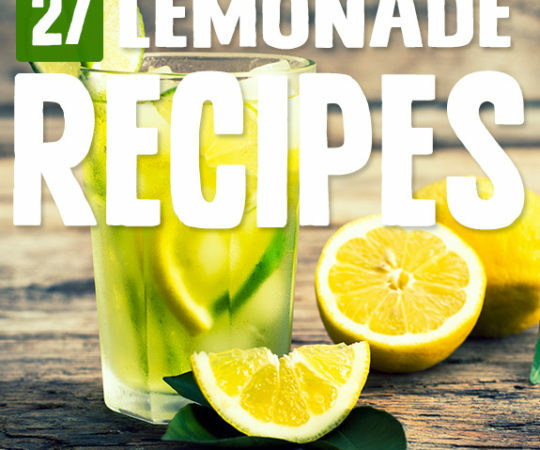 There’s no escaping the simplicity of this recipe, it tells you what it is in the title and then lives up to what it told you. It’s the combination of figs, hazelnuts, and water that becomes a milky substance when you follow the provided directions. This is one way to make sure that you’re not using any dairy, because nothing resembling milk goes into it, but it comes out like milk when you’re finished. This is an example of a protein shake that is vegan in addition to being totally Paleo, with protein coming from the hazelnuts. 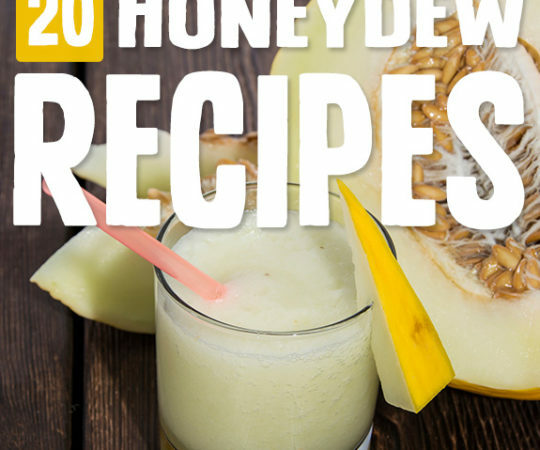 This recipe can become your go-to protein shake because it is filled with flavors that are time-tested and approved generation after generation. Chocolate and banana go great together, and you’re adding in some coconut oil to give it a buttery taste. 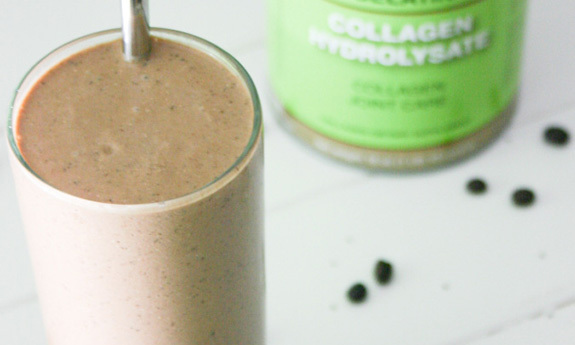 This uses gelatin for the protein, a popular choice when it comes to Paleo protein shakes because it doesn’t include any whey, so there isn’t any debate over whether it’s Paleo or not. When you use wholesome ingredients like these it’s no wonder that so many Paleo followers are able to stick to the diet because it doesn’t feel like one. When you limit the number of ingredients to just 3 you know that you’re going to have a finished product that is natural and tastes good. The advertised ingredient is dates, and here they’re using medjool dates. These dates have a natural sweetness to them which means you won’t need to use any refined sugar to sweeten it up. Almond milk and a frozen banana finish off this recipe, and you’ll be amazed at how good three ingredients tastes when it’s all blended up and you’re ready to go. Sometimes less is more, and sometimes more is more too. In this shake you’re getting a decent number of ingredients to come up with a taste that resemble a cobbler, but in drinkable form. The remarkable part of this shake is that they’ve managed to keep it Paleo, even though it uses many ingredients. 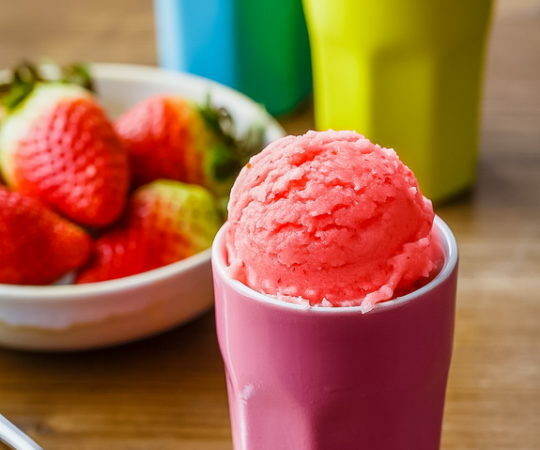 It’s worth the time to source all of the different items that go into it, especially if you’re looking at this shake as more of a treat than a workout finisher. Raw pecans and ground flax supply the protein. Part of the reason why Paleo works so well is that it saves you from things like Shamrock Shakes. If you happen to find this seasonal shake at McDonalds you’ll do best to avoid it. It’s loaded with all sorts of things that were never meant to go into the human body. 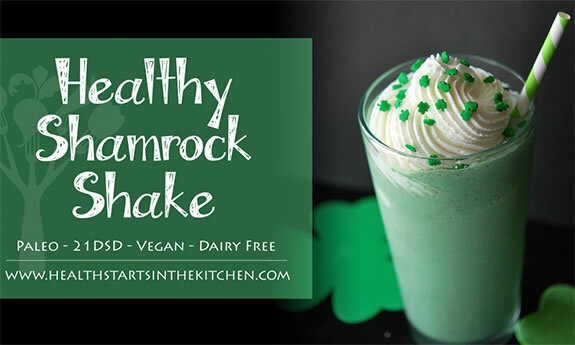 This healthy shamrock shake is not only Paleo, but vegan as well, which means it is full of nourishing foods that will help your body. 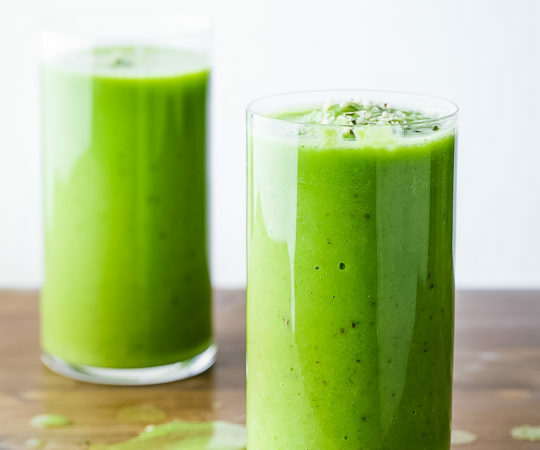 Coconut milk, bananas, and spinach are just some of what you’ll find in this naturally green shake, which has no need for artificial coloring. 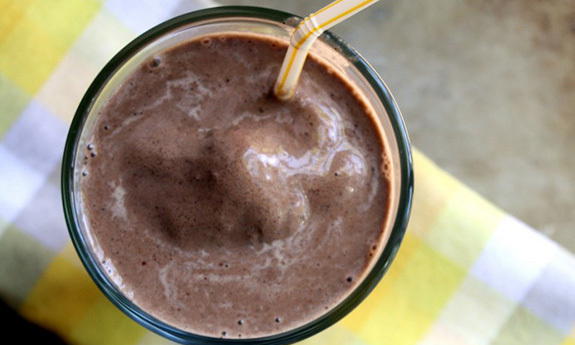 This is a shake that’s worth getting out of bed for. They’ve taken the crowd pleasing flavor of chocolate and strawberries and added in pomegranate for good measure. You have several choices on how you add your protein on this one. You’ll be getting some from the chia seeds they have you adding in, and they mention that you can also add in your choice of protein powder for that ultra protein kick. With this flavor combination this will be a shake that gets made on a regular occasion. Nothing’s going to get in your way when you’re fueled by protein. 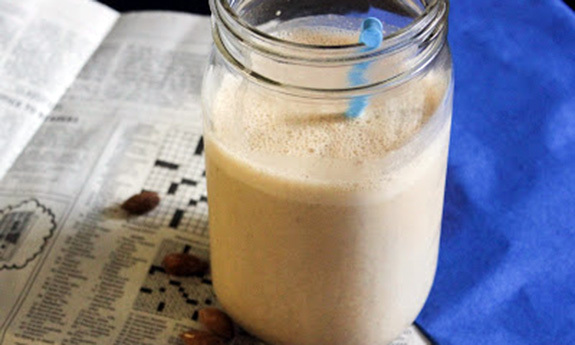 Start your morning off on the right food with this protein shake that has coffee in it. The coffee will help suppress your appetite, and the protein will as well, while keeping you focused to get through a busy morning. If you are waking up early to get your workouts in, you may find that some mornings you need some extra wake up assistance. 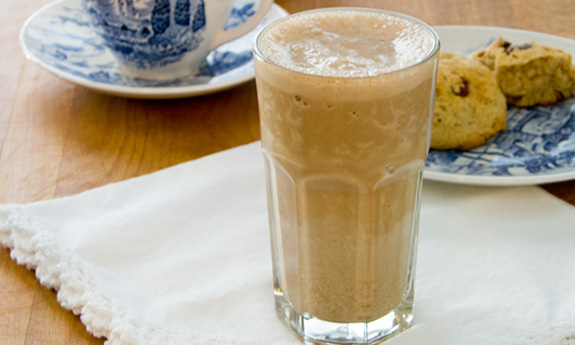 This protein and coffee-laced shake is the perfect fix for a sluggish morning, or one where you gave it everything you had at the gym. I’m sorry to be one of those people to ask for a substitute, but I have a reaction to high amounts of gelatin. Is there a high/er protein shake that doesn’t use any type of protein powder or gelatin? TIA!